The newcomer in the Minnesota Capitol's corner office is busy studying lawmaker biographies, getting up to speed on pressing issues facing the Legislature and trying to project an open-door policy even on the thorniest of issues. For good or bad, DFL Gov. Tim Walz came in without much history in state-level affairs despite a dozen years serving in Congress. That means few of the deep-rooted relationships or long-held grudges that can propel a governor's agenda forward or hold it back. Now a month into his new job, Walz prefers to see it as an advantage in a place where breakdowns and standoffs had become the norm. "It gives us the chance at resets and fresh starts," he said in a recent interview with MPR News. 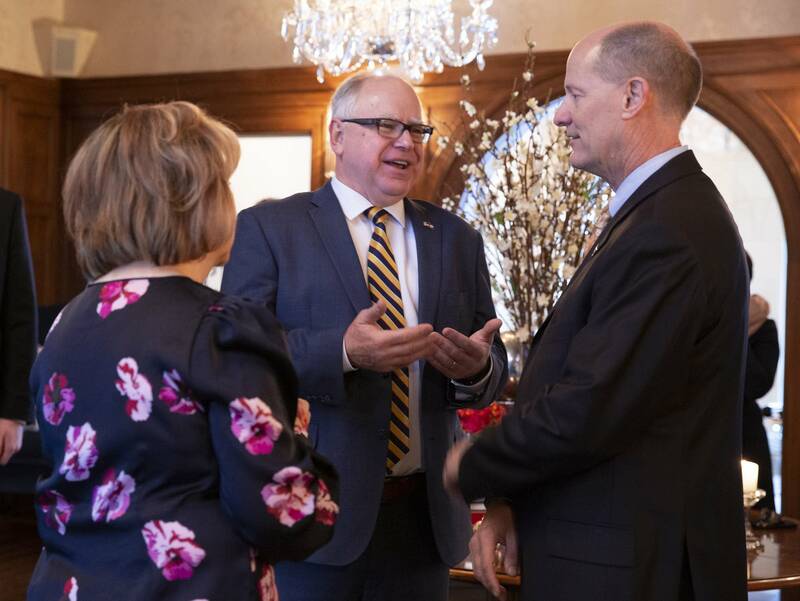 Starting Tuesday, Walz will bring waves of Minnesota House and Senate members to the official Summit Avenue residence to mingle with him, wife Gwen and a few agency commissioners. The receptions, including 30 lawmakers each and a guest of their choice, are meant to be informal get-to-know-you events. The guest lists won't be based on seniority, party affiliation or anything strategic. "We're just going to go alphabetical," Walz said. Sorry, Rep. Nick Zerwas. It's similar to the way he's thumbing through bios for 201 legislators — learning about where they're from and went to school, what they do away from the Capitol and how big their families are. It's not opposition research, he is clear to say. Rather, he said it's easier to build a rapport with someone if you know where they're coming from. "I've always been of the belief that not assigning bad motives to people of why they're doing things all starts with getting to know them," Walz said. There's no question Walz is in the midst of a first-term honeymoon. He gets hearty applause and kind receptions at appearances around the state. Lawmakers aren't rushing to land blows. Then again, Walz has made few of the tough calls that await any governor. His budget release later this month will be the first test of whether the Capitol harmony is going to last. "So far so good," said Senate Majority Leader Paul Gazelka, the Legislature's top Republican. "May is when it gets extremely difficult. So if you build the bridges early, you have the opportunity. He's doing that. I'm doing that." • Your thoughts: What should be done with the surplus? Gazelka, an insurance agent from Nisswa, Minn., has met with Walz five times so far and spoken by phone with him about as much. They had breakfast again on Wednesday. They already know where intractable divides likely are — marijuana legalization is one with Gazelka against and Walz in favor. Same goes for an increase to the state's gas tax, which the governor plans to propose and Gazelka is sure to oppose. But both say the early debate has been healthy. "So far I would say his outreach is genuine," Gazelka said. "Mine is as well." Walz will undoubtedly have an easier time with the House, which is now controlled by fellow Democrats. House Speaker Melissa Hortman, DFL-Brooklyn Park, said she's still getting acquainted with Walz. She had to research his positions from his campaign website after Walz won and the DFL seized House control. "I like what I see and I like the personality," Hortman said. The Senate is where his ideas could rise or fall. Already, Walz has convened private discussions with key lawmakers on big topics. Sen. John Jasinski, a first-term Republican from Faribault, Minn., sat through one on MNLARS, the troubled vehicle licensing system that government leaders are still working to fix. "He comes in fresh," Jasinski said. He and Walz aren't exactly strangers; Jasinski was Faribault's mayor for part of the time that Walz represented southern Minnesota in Congress. But Jasinski said he came away a tad surprised but impressed with the openness Walz has to Republican ideas for righting MNLARS, which include the possibility of hiring a private vendor to take on a larger role in the technology project. The senator contrasted it with how former DFL Gov. Mark Dayton dealt with legislators on the topic. "He was a little more standoff-ish," Jasinski said of Dayton. "Governor Walz is not — very personable, down to earth, a guy you can just sit and talk with. Maybe it's because I feel a little more comfortable with Gov. Walz than I did with Gov. Dayton. I'm hoping he's going to live up to what he said in our private meetings and get things done." Walz committed to accompanying Jasinski when the lawmaker renews his vehicle registration next so he can get a firsthand look at how the process goes. Julie Rosen is one of the most powerful Senate Republicans as the chair of the Senate Finance Committee, which is the certain stop for any budget measures. She's optimistic Walz will be a partner on a range of issues, including a strategy for combating the opioid abuse problem. The governor has had small-group discussions with legislators on that, too. "He's very intelligent. He's very passionate," Rosen said. "I think he's a very good listener to this point and I hope those listening skills continue." Rosen, of Vernon Center, Minn., has geographic connections to Walz by virtue of her district, south of his home base of Mankato, Minn. He once took her as his guest to the State of the Union speech. That's made her something of a go-to source for intel requested by her colleagues. "Is he that sincere? Is he really that concerned or is he just going through the motions?" Rosen said, recounting the questions she's been asked. "My reply is, 'He is that concerned.' He is trying to get up basic to speed on what we've been dealing with for a very long time — because his issues were on a different level before — but now they're his issues." As he develops concrete proposals, including that nearly $50 billion two-year budget, Walz said he'll carve out time to cultivate stronger relationships. He's talked of starting a running club, going on snowmobile outings, attending athletic events for children of legislators and hosting regular breakfasts where policy doesn't have to be the focus. "We've gone so far down that road of acrimony and accusations that people know the public is tired of it. I think legislators are tired of it," Walz said. "So I do want to have a different opinion. I want them at the end of the session to say we disagreed but we did it in a different way." MPR reporter Briana Bierschbach contributed.